The trail ride has several switchbacks, then the trail opens into a beautiful valley with excellent opportunities for photography. The valley floor is full of lush vegetation and wildflowers with mountain ridges on both sides. Ivan Carper Pass #1661 overlooks the Lakes Basin area and affords you a panoramic view of Eagle Cap peak. The trail between Mirror and Minam Lake (#1661) is quite steep but passable to stock. 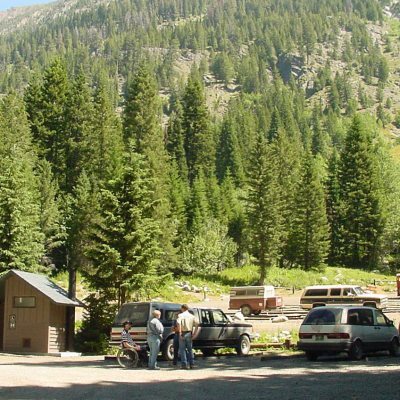 Dispersed camping is available at Mirror and Minam Lakes but make sure you follow the Eagle Cap Wilderness Regulations. Blue Lake is located approximately 1 mile south of Minam Lake and surrounds you with beautiful scenery, but limited camping. The best fishing for brook trout is July through September, depending on weather conditions. There are two stream fords on the #1670 trail back down to the Two Pan Trailhead. The Two Pan Trailhead is located at the end of the Lostine Canyon Road on the edge of the Eagle Cap Wilderness. This large trailhead has a lower car and truck parking area, and an upper truck-trailer parking are with pull-through spaces. The upper area has stock water, hitchrails, and a loading ramp. Long term overnight camping for stock is located back down the road at the Two Pan Campground.